So, we’re not getting good boat speed out of the 9-11 knots of wind speed and the wind was entering the starboard quarter of Dazzler. The lights went off and the buzzer rang, let’s put up the spinnaker. I first told Jilly that I needed to rig the running lines before we hoist the sock and set up a few other control lines. “Jilly, you are going to have to help with hoisting the sock while I keep it off the spreader.” Done. “Okay, Jilly you now have to hold the control lines for the sock and keep the spinnaker from accidentally opening before we are ready.” Okay. As I am lumbering away to the foredeck to attach the tack of the spinnaker, I look back and see Jilly double jack lined in, her hands and arms locked tightly to the control lines and a look of terror as if she is about to become airborne from the deck of Dazzler. I got back to her just in time to prevent her from showing how she could fly in an audition for The Flying Nun Returns. With everything set, we let the spinnaker fly. There it was in all its glory….Whomp! The shoot filled and Dazzler lurched forward almost ripping my toenails from the deck. Wow! We went from 3 k to Whomp! In milliseconds. See. I told you we’d go faster. We were screaming and as my luck would go the winds then increased into the high teens. Dazzler was now overpowered and screaming southward on her ear at 7.5 – 8.7 knots. We raced along for about an hour and a half before we, I, decided hanging on with feet flapping in the breeze behind Dazzler was a little intense and we doused the spinnaker. The rest of the day was a leisurely sail in the 5-6 knot range. Life is Good! On the day overall, nothing broke and nothing had to be fixed. Last night I believe we came across the east edge of the Pacific Trade Winds. 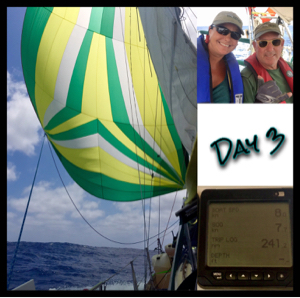 At about 0300 local time the winds filled from the north to 15 knots or so and have been steady all morning. We are currently sailing at 6-7 knots on a heading of 236°T. The main is reefed to the first reef. The staysail is up and the Jib is reefed down a bit also. Behold the power of the wind! With the ice blue color of the water all around us, the fluffy clouds pasted in the sky like cotton balls on baby blue construction paper and the breeze of the North Pacific trades, it appears as if we are the only people in the world. A small speck in a really big, BIG, body of water. Neptune and Mother Nature are in harmony today. It becomes clearer that the same feelings we have are the same feelings experienced by adventurers that have gone long before us. With no GPS, autopilot, cruise director or refrigeration. Yes we have with us all the latest do dads that we can afford to increase our safety at sea, but the basic instinct of travel and doing something the majority do not attempt is exhilarating to the senses. Hey wait a minute, I need to get back to the sailing thing and enjoying life. Until next time, this is Captain Dan going back to watching the world go by at 6.5 knots. Cheers! We are so grateful! Thank you for sharing. Larry is now following too. Uhh… What happened to Isla socorro?